Home - what exactly does that word mean? Hard to explain. If you have stayed all your life long in the same place, you might be able to give a pretty definite answer to that question. If you have lived in several places - well, it might be more difficult. If you have lived on a bunch of continents - well, then it might be pretty difficult sometimes. After having stayed in North Carolina for only nine months, I realized that I started to call Carolina home. Strange. I didn't quite understand it. But it felt right. But at the same time Switzerland is still home and sometimes other people got confused when I was referring to both Carolina and Switzerland as home. It was always immediately clear to me which one I meant - but I called them the same way and therefore for everybody else, it was not obvious which one I was talking about. 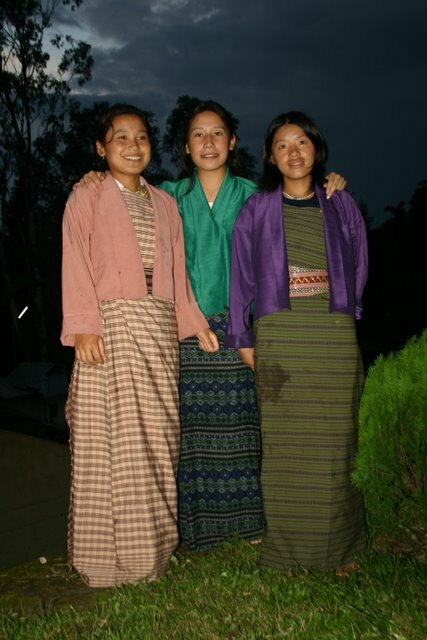 This week was the last week of classes for the students here in Samtse. They'll have exam this week and break will start the week after. It'll get pretty empty down here without all the students and I'm already missing them. 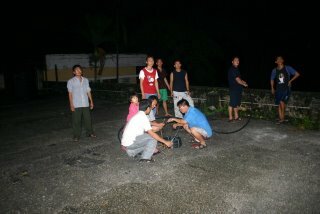 I had a good time together with them. We had our last FIT class on Wednesday - so I invited my students for dinner after the class. We ordered the food in the canteen, took it up to the classroom, and had just a really good time. We got together - and well, if Bhutanese guys get together, everybody has to sing. Not just all folks together but individually. And because I was the chief guest, I had to start. Hehe, I was singing 'Alperoose' but couldn't really remember all of the text. 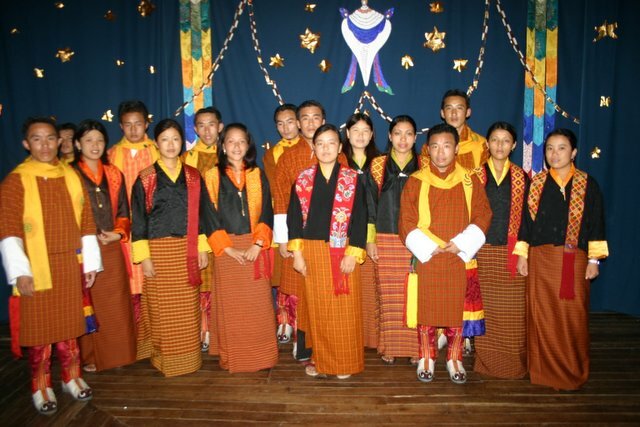 The students sung English, Bhutanese, Nepali, and Hindi songs. Was amazing and I enjoyed it a lot. After the social session, we got food. Sure, I had to get first (as chief guest). Was really good and I enjoyed it a lot! 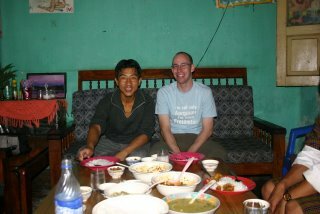 Then, on Friday, the students told me that they'd organize a dinner for me on Saturday night. They organized food, prepared the classroom nicely and just did a great job. We took another time pictures, were dancing, singing (I was singing La Montanara), and playing games. The food was excellent - but that's not what this whole thing was about. It was about getting together. You know, it was one of those moments that you cannot really describe. You look into their eyes and no words are necessary. You cannot capture it rationally - and that's ok that way. 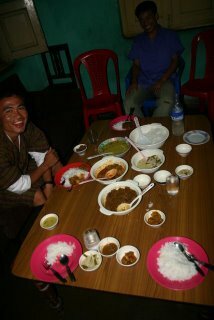 And sitting on the floor with all those guys and eating a traditional Bhutanese meal, I realized that this place started to feel like home. And I started to understand what home means to me. It's not about a physical place. It's not about all the nice materialistic stuff that we can get in Switzerland. It's not about all the convenience. It's not about luxury. It's not about a language. It's not about the fact that you grew up in a place and are used to it. It's all about the folks. It's all about the ideas. You might not be able to understand this. You might even be offended. But in all the time here in Bhutan, I have never really missed Switzerland. I have missed Switzerland when I stayed in the US. But not here. I miss my family and my friends; very true. But not Switzerland. Well, that evening was one of the moments that makes it worth staying abroad and fighting all the hard battles that you have to fight. You learn a lot - and sometimes, you even feel like crying. Not because you are sad but because you are really happy. Almost all the boys of my class. Almost all the women of my class. 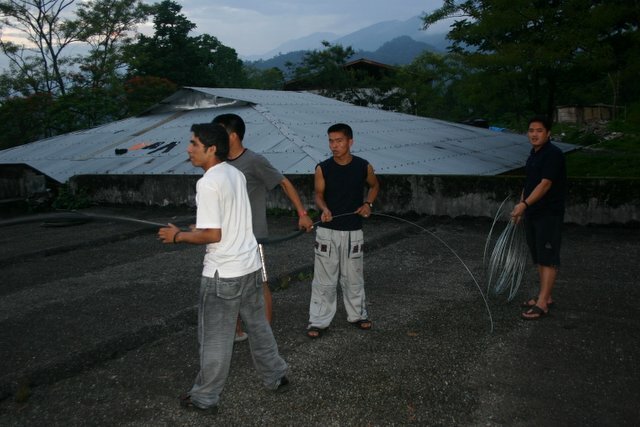 ... is currently consumed by staying here in Bhutan. So if you don't get a response to your emails immediately - sorry for that. I haven't forgotten you and will reply to you one day. The LAN manager of the NIE has left for training and I'm basically the person that has to make sure that the IT infrastructure is at least partially running. Yesterday, our proxy server collapsed and crashed every hour. Today, the same server is doing again fine and is now up for eight hours. Don't ask me what it was. In fact, I'm not supposed to keep that infrastructure running. Well, I could write a nice analysis and a paper about Distance Education and IT while at the same time the infrastructure at the NIE breaks down. Or I could try to keep the infrastructure running and put off the real work that I'm supposed to do. Well, I chose the second option. Let me recycle part of my midterm report to the Swiss Civil Service authority. Guys, have fun and enjoy life! Staying in a new culture and environment, you sometimes run into problems. I knew that and IÂm perfectly ok with that. Sometimes, it costs a lot of energy to be always this special guy. You have ups and downs. But that's ok. I can cope with that. All in all, staying here in Bhutan is a huge experience. It is not always easy but I'm constantly learning and I really appreciate having this chance. 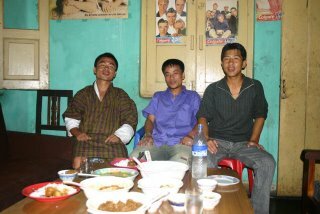 If I could go back and decide again whether I'd like to do my civil service in Bhutan, I wouldn't wait a single second and take the opportunity. No physical, psychological or health problems have shown up so far. I'm confident that in case they would show up, I know people well enough to get help ;-). 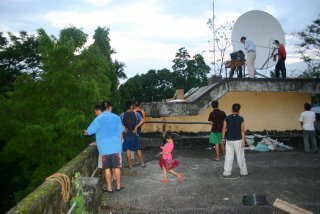 Accommodation is ok although my apartment doesn't have a roof and monsoon has already started. I'm cool with the current situation - I don't yet have to use an umbrella to cook food ;-). I might have to move my bed to a different room within two weeks - but that should work out as well. Helvetas is doing a great job and supports me whenever it is needed. No complaints here. Working condition is ok. Working Saturdays from 8 to 12 (and sometimes I end up working longer). Generally, I'm probably working more than it is requested - but most IT people probably do that ;-). Staying in Bhutan is all in all a great experience. Oftentimes, I'm tired but that's ok. Oftentimes it's more difficult than staying back home would be. But that's ok. I'm learning a lot about a new culture, about a country, and about myself. This morning during the assembly, I had to speak about a random topic. 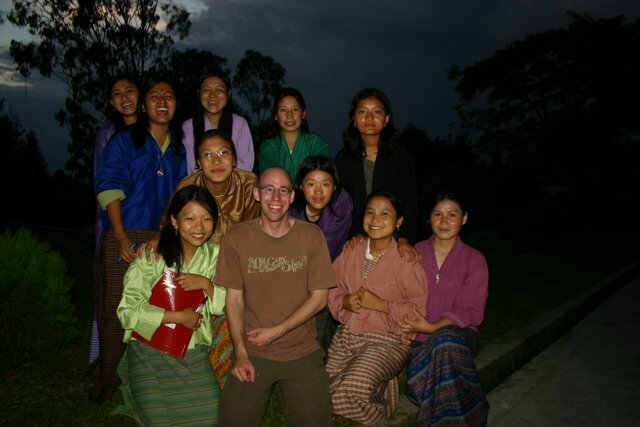 So I choose to talk about what it is like to be here in Bhutan. My experience. Feel free to smile ;-). For xmas, I got Jamie Zeppa’s book ‘Beyond the Sky and the Earth: A Journey into Bhutan’. I read it eagerly and was asking myself: What will it be like for me? What will I bump into? It’s a fascinating book – but sometimes it was really hard for me to relate to the things that she is describing. In the beginning of the book, Jamie describes that the girls of her class help her to get properly dressed. Well, I couldn’t really understand that. I was used to pants – and it is not too hard to put on pants correctly. After having stayed here in Bhutan for a bit of time, I can relate extremely well to what Jamie is describing. I know exactly how it feels to come to school and not be properly dressed. I know exactly how it feels if you have to ask students to help you put on your Gho. I know exactly how it feels to have problems to properly dress yourself. I know exactly how stupid you feel walking around campus and your Gho is all over the place – but just not the way it should be. I’m honest with you guys; sometimes, that’s pretty hard. Sometimes I have to fight. Sometimes it is humiliating. But that’s ok because it’s the only way to learn how to wear a Gho. You have to be able to put it on correctly in the mornings when you feel really bad. Only if you are able to put it on correctly in one of those mornings, you really know how to do it. During the last few weeks, I have not only tried to learn how to put on a Gho correctly. I have gotten in contact with a new culture. Being put into this new context, I have lost part of my frame of reference. Often, I’m not quite sure how to act. Sometimes it costs a lot of energy to be not quite sure. But that’s ok – it’s the only way to get exposed to the culture and learn about the way it works. Assume that you are blind. You have been living in a room for the last year and you know every inch of that room. You can move around without danger of bumping into the walls or chairs. You know exactly how your environment looks like. But one good day, you get a second room. On one side, that’s a great thing. You have more space and can organize your furniture differently. On the other side, you are lost in the new room. You don’t really know how this new room looks like. The only way to explore this new room is to bump into walls. If you don’t bump into walls, you don’t really know where the boundaries are. You can bump into walls softly or with full force. If you bump into them too softly, you might not explore the final boundaries. And if you bump into them too hard, you might get hurt. Here in Bhutan, I have been bumping into a lot of walls. Bhutan is the room that got added to my apartment. Sometimes, it hurts to explore it. Sometimes, it feels just great. And I know that I will bump into more walls. But bumping into walls means to expand the space that you can live in. Bumping into walls is hard – but I know that it is the only way to learn. To really learn. New rooms are getting added to your personal apartment - so you are bumping into walls. But as well the apartment of your country gets expanded – and you as a nation are bumping into walls. Sometimes, it hurts. Sometimes, it feels just great. Nobody claims that it is easy. But it’s the way to learn new things. Don’t be afraid to bump into all those walls – it will help you to expand your apartment. If I had to name one person that is responsible for whom I am today, this person is one of my teachers. He helped me to choose a good subject for my studies. 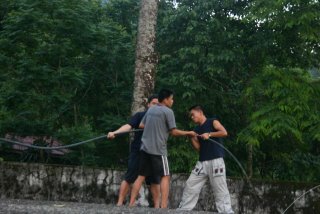 He is responsible for me staying here in Bhutan. It’s not his subject knowledge that is the reason why he shaped me. It is his personality. It’s the way he taught. It’s the way he interacted with us. You will shape the next generation of Bhutan. Teach those kids how to bump into walls. Teach them how to bump into walls in a responsible way. Nobody claims that it will be an easy thing. Sometimes, it’s probably going to be a pretty hard task. But that’s ok. That’s how we learn. That was the long version of what I wanted to tell you. The short version basically says the same – just in a different way. Thanks a lot for letting me bump into walls. Thanks a lot for showing me all those new rooms. Thanks a lot for expanding my space of living. Thanks for accepting that I’m sometimes different and that I cannot adapt to how you do things. Thank you. I bumped into a lot of walls and have learned a lot. Sometimes, it’s pretty hard. But I know that this is the way to learn. I learned here in Bhutan what is important in my life. And I learned about all the things that I don’t care about. I’ll return back home as a different person. Thank you. 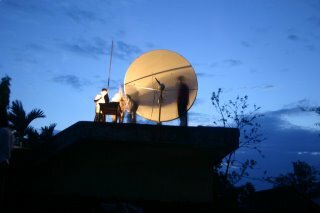 Thanks to VSAT, a first video from NIE Samtse is online on video.google.com. Foundation day was celebrated about two weeks back. In the morning, we had a ceremony in the auditorium and then later on, everybody went out to the football ground to watch the final of the khuru tournament. Watching the video, you will get in contact with khuru (some sort of a dart game), the dances performed after having hit the target, traditional songs and dances, and just a bunch of really good students down her at NIE Samtse. 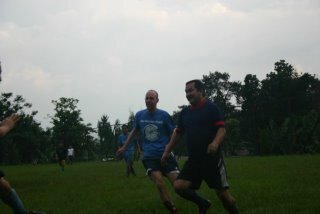 Guys, have fund and enjoy the Soccer World Cup! Guys, today it will be a picture post. 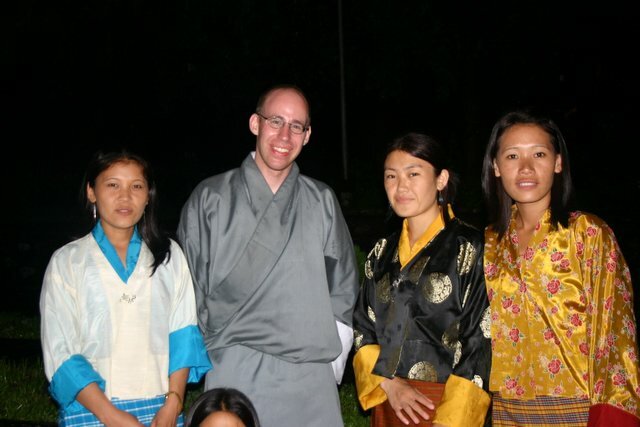 Let me just document part of my life down here in Bhutan. 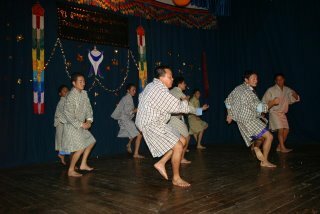 Cultural show; folks in traditional Bhutanese dress. Traditional dance performed in a non-traditional way ;-). VSAT is coming! But first we have to do some hard work! 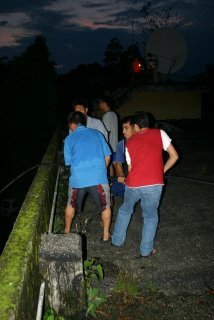 Getting the cable into the pipe. The cable is almost in. The satellite dish up and running.